Where's the bottom for Microsoft's Internet Explorer? Millions more deserted Microsoft's browsers last month, adding to what can only be described as a collapse of the company's place in the browser world. According to analytics vendor Net Applications, the combined user share of Internet Explorer and Edge fell 1.9 percentage points in September, ending the month at 30.6%. The string of losses showed no sign of letting up: September's decline was the sixth in a row of 1.9 percentage points or more. IE and Edge have shed 18 percentage points so far this year, a 39% decline in just eight months. Simply put, no other browser has bled user share this quickly, with the possible exception of Netscape Navigator in the 1990s. If declines continue at the rate of the last nine months, IE + Edge will fall below the 25% marker by the end of the year, and under 20% by March 2017, Computerworld calculated. Microsoft's problems with browser deserters have benefited Google most, but last month the Mountain View, Calif. company's Chrome added just four-tenths of a percentage point to its share, less than a fourth of the average over the last 12 months. During September, Chrome accounted for 54.4% of all browsers. The biggest beneficiary of IE + Edge's September drop was Mozilla's Firefox, a browser that has been on a steady spiral of its own this year. But last month was an exception, as the open-source browser gained 1.5 percentage points, the largest one-month increase since November 2008, erasing almost all the losses of the previous four months. Firefox ended September with a 9.2% user share. The huge jump for Firefox may not have represented millions suddenly switching to the browser, but may instead have been a quirk in Net Applications' measurements or a recalibration of the actual decline of that browser. Microsoft's browser collapse was triggered when the company stopped supporting all but the newest browsers -- IE11 and Edge -- in January. Microsoft's early end of support for some versions of IE gave users a choice of upgrading to a newer edition of Internet Explorer (or upgrading to Windows 10 and adopting Edge) or dumping IE for a rival. Millions did the latter. Using Net Applications' data for browser and operating system user share, as well as Microsoft's oft-made claim that about 1.5 billion PCs run Windows worldwide, Computerworld put the collapse of IE (and Edge's inability to make up the losses of its predecessor) in terms of millions of users. At the end of September, IE and Edge were being run by approximately 506 million users, down 33 million from August's 539 million. Since Jan. 1, IE and Edge have lost about 292 million users. 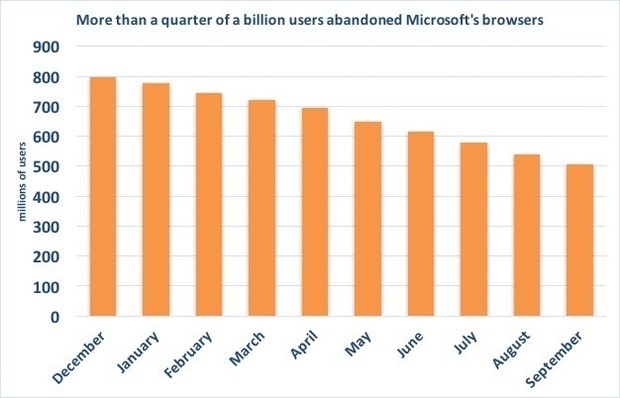 Almost 300 million users abandoned Microsoft's browsers so far this year, and there were no signs of a let-up in losses.